Diastasis Recti is a separation of the outermost abdominal muscle (six pack) called the Rectus Abdominis. Connecting the two sides of the Rectus Abdominis together is a dense line of Connective tissue called the Linea Alba. Over the course of pregnancy the expanding belly makes the Linea Alba extra stretched and thinned creating gaps or separation. In many cases the gap heals naturally in 4-12wks. In the case of Diastasis Recti the gap does not close completely and the overstretched and weakened Linea Alba gives very little support for the inner organs. The organs press against the abdominal wall causing your belly to still look pregnant to some degree. To be perfectly clear, there is no scientific data that definitively says one of these is the cause. Incorrect excessive abdominal work or weight lifting during pregnancy. 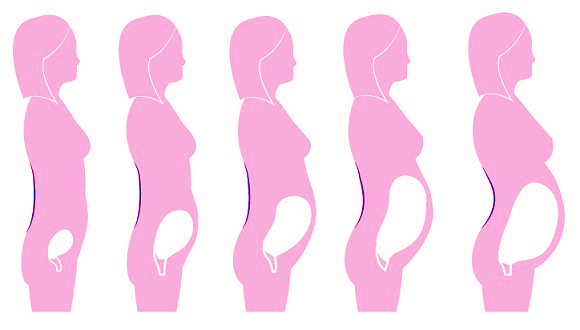 Another contributing factor is the enormous posture transformation during the course of pregnancy. Over 9 months the shape of your spine dramatically changes to accommodate your growing belly. This is a necessary function, if your frame did not adjust you would topple forward. The end result is an anterior tilt (exaggerated curve or arch) in you lumbar spine (lower back) which can take anywhere from 6 months to 2 years to correct its self. 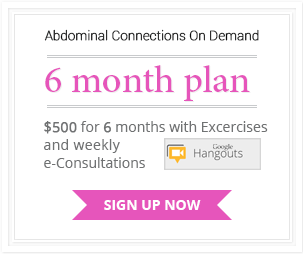 This is an important component to healing your Diastasis. 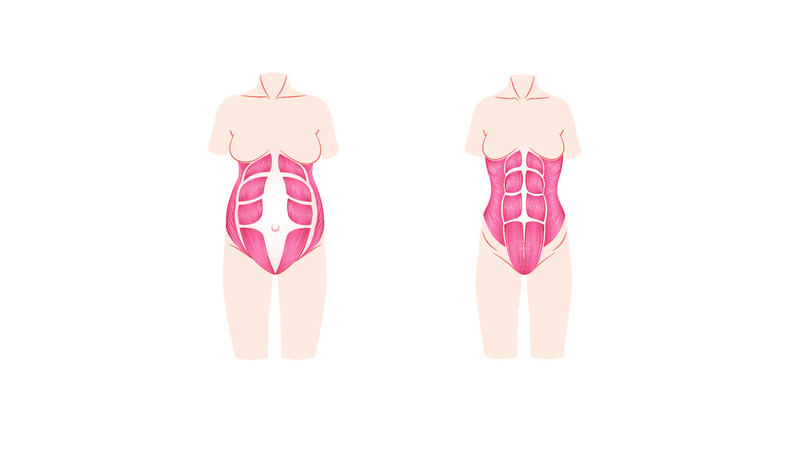 Post pregnancy the exaggerated arch directs the inner organs forward creating extra weight on the abdominal wall and pushing against the already weak Linea Alba (connective tissue). If even a minor Diastasis exists the continual pressure over time will create an even larger gap or at the very least keep the existing gap from healing. 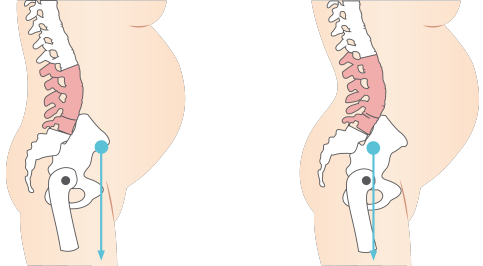 Abdominal Connections teaches techniques to identify and correct your spinal alignment eventually returning you to your natural shape and lessening the pressure on your Diastasis. Why some people have it to a lesser or greater degree is still undetermined. As my OBGYN put it “It’s just bad luck”. All pregnant women have a diastasis to some degree. There is not enough clinically proven evidence to support Genetic contributions however my own personal experience in the field has led me to believe there is a strong connection. Healing your Diastasis involves a combination of binding, exercise, and mental retraining of basic and non-basic physical movements. Abdominal Connections addresses every aspect of the healing process from superficial tummy skin to the necessary strengthening of compensating muscles to avoid re-injury. Our 6 Step Program program promotes Healing from the inside out using all the tools available and addressing every detailed component associated with the Diastasis-recti condition. As with any muscular injury it takes time to heal but we believe our method is the most efficient, methodized, and productive therapy available on the market today. Waiting for results can be a painfully frustrating. Believe me I’ve been there. The truth is for most women recovering from labor is a lengthy and confidence testing challenge. It’s a balancing act of taking care of a very new fragile, and dependent life, and taking time to heal yourself from an extremely traumatic physical and mental experience. For those of us with multiple children it can at times seem like a hopelessly impossible task. Combine that with hormones and your left with feelings of discouragement, terrible self-esteem and a defeated attitude toward achieving your pre-pregnancy body. 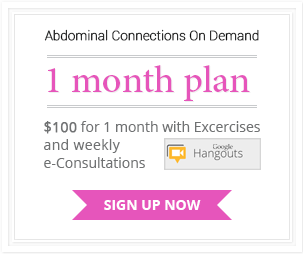 Abdominal Connections is designed to help women who feel they have no time to help themselves. We understand that the busy lives of moms today does not always allow for the necessary time to exercise let alone do the therapy required for the healing your Diastasis. If you do any of the 6 steps you are going to make progress. The more steps you do, the faster your progress. Two steps a day and you won’t fall behind. Three steps a day and you’re on your way to recovery. Four step a day and you’re ahead of the game.